It's Health & Fitness Month at Mobile Nations! Okay scale, you hate me and I hate you. That being said we’re going to have to put aside our differences if we’re going to get through this. We both want to see the numbers drop, trust me, I know. The problem is that I think I’m putting more into this than you are. Sure, you’re measuring my weight and displaying it for me (while silently laughing at me), but I’m the one trying to lose it and figuring out my progress. That’s it, I’m bringing in an assistant, don’t try and stop me. Its name is OnePound and it’s going to help crunch the numbers for me. It’s going to let me to focus on diet and exercise, while it keeps track of weight loss, calculates my BMI and charts my journey to skinny town. What about you? Well, why don’t you just sit there and let me stand on you – without screaming for once? The UI for OnePound is beautifully basic. Nearly everything you need to manage with this app is found in one screen. The only exception is the options screen that asks if you want to go metric or imperial, as well as prompts you to enter in your goal weight and current height. 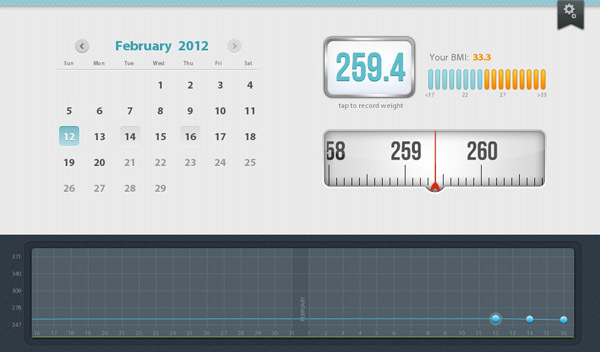 In a nutshell, OnePound helps you track your weight loss/gain by date. The upper-left corner of the screen holds the calendar, where you can tap on a date or scroll through time. It appears to be designed to record recent history, as you can only go back in time month by month, rather than selecting a year. The upper right side is where you would see your calculated BMI. Colour coding help indicate what a healthy BMI rating would be, with blue showing a healthy level and orange being a high or low level. Again, this is based on what you recorded your height to be as well. Just below this is the scale which is used to record your weight. 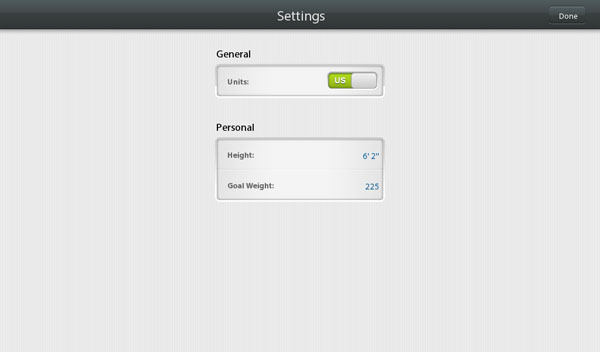 Being very responsive, you can quickly and easily swipe through the numbers until you’ve found your current weight. Be honest, you’re only cheating yourself and the pants that no longer fit. Running across the bottom of the screen is the progress graph. Here, your weight and goal are found, represented by a blue and green line, respectively. 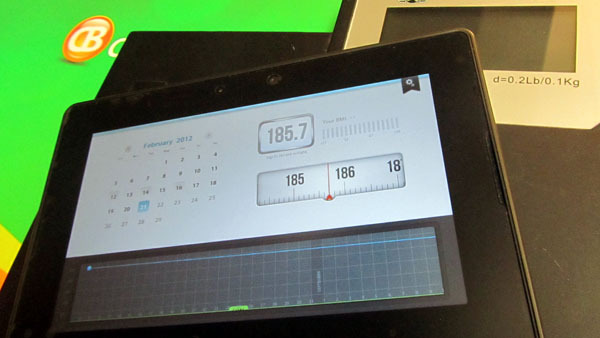 The graph measures weight over time, allowing you to see the progress you may or may not have made. For some, this is all the information you need to be motivated. You may get confused and frustrated with other stats. This could lead to you becoming discouraged. OnePound focuses on a few details and focuses on presenting those details to you in a clean format. It’s pretty simple to update the application, as well. The only drawback I see is the inability to export the details via email (say in a spreadsheet). It would be nice to share your success with others, without having to take a screenshot. When trying to simply focus on your weight, do you really need to use something so complicated? For me, OnePound is an app that offers a lot of help, but requires little attention. With everything you need on one screen, it’s beautifully presented. There’s no way to share the information, except through screenshots…and passing your BlackBerry PlayBook to someone. There’s also no way to track multiple people or ability to reset the application either. Looking for a no nonsense way to track your weight loss or gain? Pick up OnePound. It’s almost as simple as stepping on a scale – and provides more motivation, as you stick to your plan to reach your goal. If you need minimal information to go by, you’ll find the BMI calculator, progress graph and a speedy swiping scale to be more than enough.